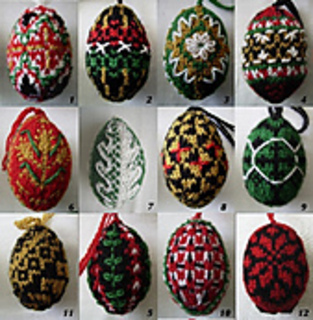 Inspired by the traditional Ukrainian Easter eggs, this version uses stranded knitting and embroidery to create ornaments for Easter or Christmas decoration. Each egg uses roughly 20-25 yards of yarn, so a great way to use up small amounts of leftovers. The samples were knit in Palette, in serrano, grass, turmeric, black, and white. The pysanky are knit flat, embroidered, then sewn up and stuffed. The pattern includes graphs for 12 different eggs and a variation on one. Knit at the recommended tension, each egg is 3-3.5” high, and they will fit in a large egg carton. Note: I am not recommending this pattern for beginners. You will be doing stranded knitting on both right and wrong sides of the work, coupled with some fairly abrupt increases and decreases. Embroidery suggestions are given, but some experience of embroidery would be helpful. Most of the eggs will also look good without embroidery, though.